TimesTen is a high performance event-processing software component that enables applications to capture, store, use, and distribute information in real-time, while preserving transactional integrity and continuous availability. Applications that incorporate TimesTen can process massive transaction volumes and respond instantly to requests using less expensive hardware configurations than would be required by conventional software architectures. TimesTen has been successfully integrated into many applications in telecom and networking, financial services, travel and logistics, and real-time enterprises. Why is TimesTen Faster Than a Conventional Database? In a conventional RDBMS, client applications communicate with a database server process over some type of IPC connection, which adds substantial performance overhead to all SQL operations. An application can link TimesTen directly into its address space to eliminate the IPC overhead and streamline query processing. This is accomplished through a direct connection to TimesTen. Client/server connections are also available to applications. From an application’s perspective, the TimesTen API is identical whether it is a direct connection or a client/server connection. 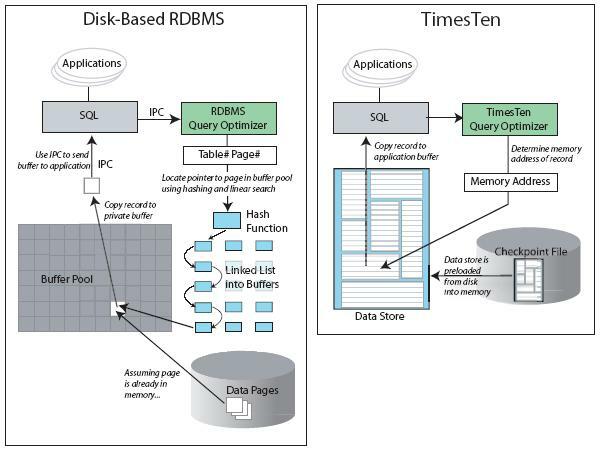 Furthermore, much of the work that is done by a conventional, disk-optimized RDBMS is done under the assumption that data is primarily disk resident. Optimization algorithms, buffer pool management, and indexed retrieval techniques are designed based on this fundamental assumption. Even when an RDBMS has been configured to hold all of its data in main memory, its performance is hobbled by deeply interwoven assumptions of diskbased data residency. These assumptions cannot be easily reversed because they are hard coded—spanning decades of research and development—within the deepest recesses of RDBMS processing logic, indexing schemes, data access mechanisms, etc. TimesTen, on the other hand, is designed with the knowledge that data resides in main memory and can therefore take more direct routes to data, reducing codepath length and simplifying both algorithm and structure. When the assumption of disk-residency is removed, complexity is dramatically reduced. The number of machine instructions drops by at least a factor of ten, buffer pool management disappears, extra data copies aren’t needed, index pages shrink, and their structure is simplified. When memory-residency for data is the bedrock assumption, the design gets simpler, more elegant, more compact, and requests are executed faster. So we need a TimesTen In-Memory Database 7.0.5 for HPUX PA-Risc (64-bit) (115,309,976 bytes). * The default instance name ‘tt70’ is in use. NOTE: Each TimesTen installation is identified by a unique instance name. Instance name will be ‘tt705dv220’. The directory /d1/TimesTen/tt705dv220/info does not exist. The TimesTen Demo applications can take up to 64 Mbytes of disk space. instance a port number within a range of 8 ports of the port you assign below. be verified by running ‘ttVersion’. The directory /d1/TimesTen/tt705dv220/doc does not exist. NOTE: The TimesTen daemon startup/shutdown scripts have not been installed. Run the script ‘/d1/TimesTen/tt705dv220/bin/setuproot’ as root. This will move the TimesTen startup script into its appropriate location.